The University of West Virginia approved a $100 million facilities master plan for an athletic improvements campaign called ‘Climbing Higher’. The plan includes $55 million to be spent on the Puskar Center complex, $35 million on the Coliseum complex, $5 million on the Cary Gym complex, and $5 million on a new golf complex at the former White Day golf course outside of the city. 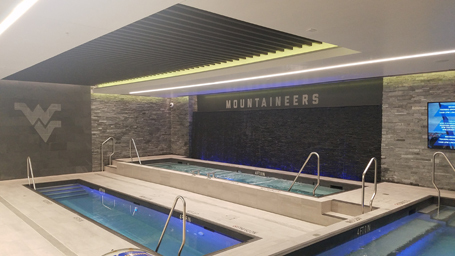 Counsilman-Hunsaker was retained to design the spas for the new hydrotherapy room at the football training facility located in the Milan Puskar Center. The $4.7 million project consisted of renovating the existing 4,450 sq. ft. training room and the 4,150 sq. ft. shell beneath the auditorium to provide an 8,600 sq. ft. training facility within the existing lower level of the Milan Puskar Center. Renovations also included the addition of two 400 sq. 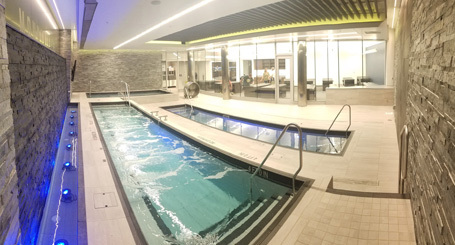 ft. pool equipment rooms, treatment area, taping station, expanded rehab area, renovated swim-ex therapy pool, expanded office space for trainers & doctors, and all new walls in the training facility.